MANILA, Philippines - (Updated as of 7:30 a.m. August 10) Some local government units (LGUs) announced class suspensions for Wednesday, August 10, 2016 due to heavy monsoon rains (Habagat) affecting Luzon and Metro Manila. At 4:00 a.m on Wednesday, the Low Pressure Area (LPA) was estimated based on all available data at 635 km east of Basco, Batanes (21.0°N, 128.0°E). Southwest Monsoon affecting Luzon and Western Visayas. PAGASA added that monsoon rains will be experienced over Metro Manila, Ilocos Region, Cordillera Administrative Region (CAR), CALABARZON, MIMAROPA and the provinces of Zambales, Bataan, Pampanga, Tarlac and Bulacan. Cloudy skies with light to moderate rains and thunderstorms will prevail over Western Visayas and the rest of Luzon. Partly cloudy to cloudy skies with isolated rainshowers or thunderstorms is expected over the rest of the country. Aside from LPA, two weather systems Tropical Storm Conson in the Pacific Ocean, and Severe Tropical Storm Omais off Japan — are forcing the Southwest Monsoon to strengthen the rains affecting the country. BATANGAS - pre-school to senior high school, private and public. Here's a guideline on automatic class suspension. 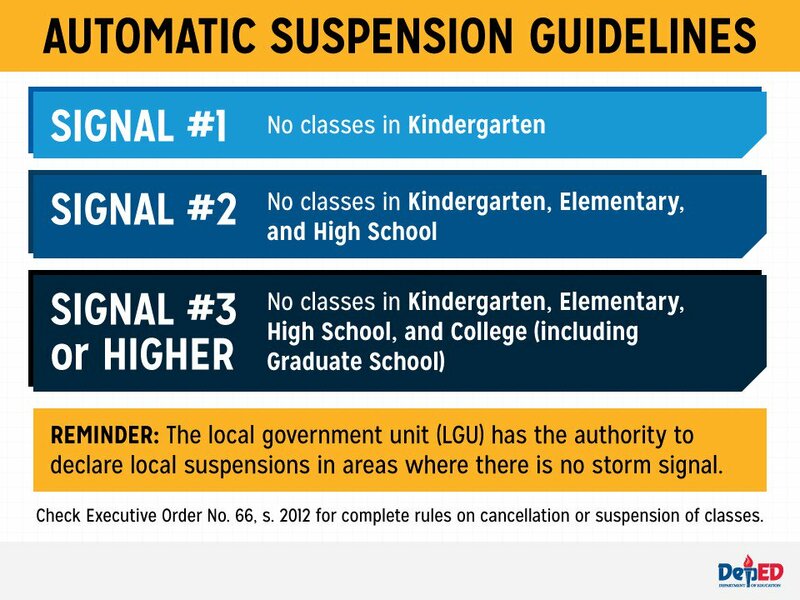 Note: LGUs have the authority to declare local suspensions is areas where there is no storm signal.